templates to monitor each child’s objectives and an end of year evaluation. Activities are supported by colourful and original illustrations to engage children’s interest and are themed around topics such as animal antics, detective stories and the seaside. An additional 5 template sessions are provided which can be used to extend the programme into Year 2. 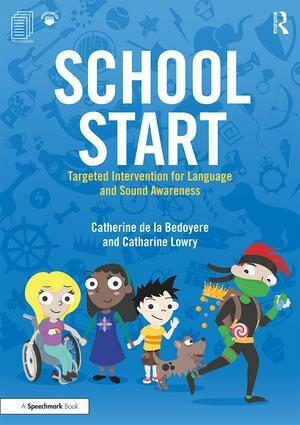 The authors provide clear guidance on how to use the resources and include an FAQ section for schools, parents and Speech and Language Therapists. This latest resource is a follow on to the hugely popular School Start and Pre-School Start and has been successfully piloted in schools. This is an invaluable resource for primary school staff that encourages good collaborative practice between teachers, teaching assistants, inclusion co-ordinators, SENCOs, speech and language therapists and parents.